Providing you the best range of four layer insulated delivery bags, delivery bags, insulated delivery bags and shirt bags with effective & timely delivery. We are manufacturer and exporter of Four Layer Insulated Delivery Bags. In order to cater to the diversified necessities of our valued clients, we are providing an exclusive series of Insulated Food Delivery Bag. This insulated food delivery bag is of 4 layer. These items are available in different shapes and dimensions at most reasonable prices.We also customised as per the clients requirement. Our professionals design these products with the help of quality tested components and latest tools. Acknowledged for its perfect finish, high load bearing capacity and light weight, these items are highly asked for in the industry. We are offering of Delivery Bags. Our delivery bags are the best thermally insulated hot and cold food delivery bags in the market, known for superior insualtion for a long time.We design our delivery bags to specifically use them in standalone mode without the need for bulky carry boxes on the delivery bikes. We are manufacturers, suppliers, and exporters of Insulated Delivery Bags. 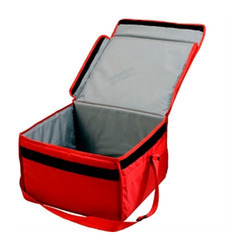 Our Insulated delivery bags are the best thermally insulated hot and cold food delivery bags in the market, known for superior insulation for a long time. We design our bags to specifically use them in standalone mode without the need for bulky carry boxes on the delivery bikes. 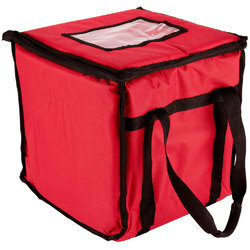 Our Insulated delivery bags are best in delivering pizza, other foodstuffs, and ice. This allows for a flexible delivery model, where regular bikes/cycles/four-wheelers can be used for delivery and also the dimensions of the bags adhere to the transportation laws in place. Color Red, Yellow, White, Green etc. We are offering Shirt Bags to our clients.